Brown rice is the bomb! I love it, I love to cook with it, I love to eat it. It’s healthy, it’s healing and it’s balancing. It’s the perfect pantry item. I usually have at least three kinds of brown rice in my pantry (short grain, long grain, basmati, not to mention whole grain red and black rice) at any given time and I use it as a side dish, in soups, to make risotto, stir fry and rice pudding, and even for breakfast. Yes, you heard it, breakfast. Cream of Rice Breakfast Porridge is a delicious and nutritious way to start your day. In the macrobiotic philosophy, brown rice is referred to as a “vital and harmonious food”. It is believed to create balance in the body. Brown rice is minimally processed, only the outermost layer of the hull has been removed, resulting in a nutrient rich rice that is a good source of dietary fiber, vitamins B1, B3 and B6 as well as iron, among other nutrients. It has a nutty flavour and a chewy texture and lends itself well to many cooking methods. If you’re new to brown rice, here is a basic cooking method to get you started. 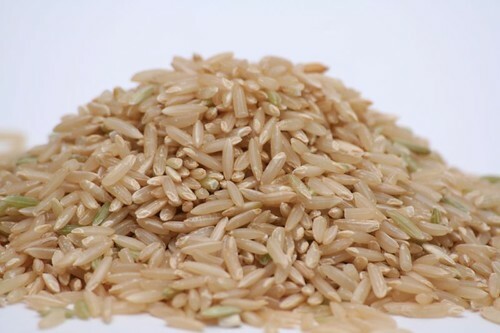 Rinse brown rice several times in cold water until the water becomes clear and free of dust. If possible, soak the brown rice overnight (approximately 8 hours), this is not essential but soaking the rice enhances the taste and makes it easier to digest. Gently roast the rice in a pot over low heat for a few minutes until they are a light golden tone. Be careful not to burn the grains in the process. Add 2 cups of cold water, turn the heat to high and bring to a boil. Add 1/4 teaspoon of salt and reduce heat to the lowest possible setting. Cover and simmer until all the water has absorbed and rice has cooked, about 40 minutes. Fluff with a fork and transfer to a hollow dish to stop the cooking process and allow the rice to cool. Serve fresh as a side dish in place of white rice or use leftovers to make a stir fry or rice pudding. Let it cook slowly and on the lowest possible heat setting. Do not add too much water, the water should evaporate and you shouldn’t have any water to remove at the end of the cooking process. Do not stir the rice during the cooking process, otherwise it will end up mushy and clumpy. A good pot with a thick base will come in handy, otherwise you risk burning the rice, or the water will evaporate too quickly and before the rice is cooked. If the water starts to boil over, you can leave the cover ajar to let out some of the steam during the cooking process and avoid making a mess of your stove top. Depending on your stove, it may take more or less time to cook the rice. If after 40 minutes the water has evaporated and your rice is not fully cooked, add 1/4 cup of water at a time and continue cooking until the grains are soft and chewy.